Siding contractors can sometimes forget that many homeowners aren't always familiar with construction and architectural terms when discussing their estimates or the scope of work required to put new siding on your home. One of the words you should listen for is "fascia" when your contractor is talking about your home. While covering your fascia shouldn't add much to your siding cost, it can make the exterior maintenance of your home a whole lot easier and much less expensive. Most homes have roofs constructed of pre-engineered trusses that are covered with sheathing and then a final protection such as shingles or metal. The trusses usually overhang the edge of the roof on several sides of the house where the pitch or slope descends. The exposed ends are called the tails. The board that covers these tails is the fascia. It can vary in height from about six inches to almost a foot on some house styles. Most homes have their gutters attached to the fascia trim, which is often wood. Wood can eventually decay when exposed to inclement weather if not properly protected. Keeping the fascia trim intact and attractive means that on a regular basis, someone must remove (or work around) the guttering while sealing the fascia trim. If that doesn't sound like much fun, make sure your siding contractor includes covering the fascia in the scope of work. What should you know about aluminum cladding for fascia? Pricing can vary depending on the size of your fascia and where your home is located. 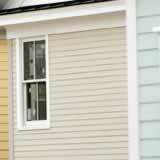 Ask your contractor how much it would be to include fascia cladding in your siding cost. You might not need to worry about painting around your gutters ever again.